Kabui was invited by the University of Michigan to be a visiting chef and lecturer, interacting with students and Michigan Dining to share his views and spur action on issues such as sustainability, social justice and the preservation of food culture. He is embracing these issues through a movement he calls “Afro-futuristic-conscious cuisine,” working to promote healthier, plant-forward diets both in Africa and the U.S.
“Afro-futuristic-conscious cuisine is deeply rooted in African dishes, but this is not the way people are eating in Africa right now,” says Kabui, who was born in Kenya. Instead, they are consuming fast food and processed food, which are seen as status symbols among African people. This behavior is increasing the incidence of obesity in several African countries, he reports. 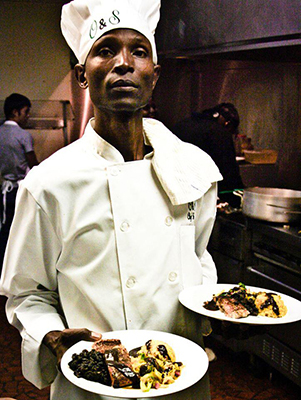 Kabui wields his power as a chef by creating dishes based on African values, traditions and indigenous ingredients—returning people to a healthier, more sustainable eating style. Millet is his favorite grain, he says, and he uses it as an ingredient in breakfast smoothies, in a porridge that can be swapped in for polenta, as a rice substitute and in desserts. Ngai ngai, a shrub that grows up to 8 feet tall, is another indigenous plant he incorporates into recipes. “The more leaves you pick, the more it produces,” Kabui says, and he uses them to infuse sauces and vegetable dishes with a lemony flavor. He also favors moringa, otherwise known as the drumstick tree. Moringa’s green leaves are especially nutrient rich, and the plant is gaining popularity as a functional food that can help fight certain diseases. Through urban farming, organic sourcing and community activism, chef Kabui is reinforcing the power and value of food, and he encouraged the chefs assembled at the Summit to do the same.